I was up very early on Easter Sunday this year, because I couldn’t sleep. A special experience to sit on our balcony and watch the sun come up over Chatillon from about 6.30am. I’ve done this often enough during the summer when that time of day is the only relief we get from the sun until the cool of the evening. But I love my bed too much to do it often on a cold April morning. The old village on the ramparts and its little chateau are always enchanting in the early light. Fired with enthusiasm, I rushed upstairs in my dressing gown to the little Juliet balcony off our spare room to take pictures of the Mirror Garden. This is the oldest part of the garden, created by the sculptor who previously owned the house as an outdoor exhibition space for his work. I tend to take it for granted now, but with the grass just cut the day before, even this difficult part of the garden was looking superb. Why is it difficult? Well, there’s perhaps a foot of topsoil up here (at the very most) before you begin to hit the rock on which the ramparts were built. The ‘lawn’ was previously watered by the sculptor during dry summer weather, but I don’t bother. And it shows. A paradise for dandelions and other weeds. Originally I wanted to make a garden in grey, green and yellow, simply to compliment the view and the mirror. I won’t clip the box until I see the first signs of the Box Tree Moth caterpillar. Clipping the beasts off and then spraying with Bacillus thuringiensis was quite successful last year, although the little dumplings are still trying to recover properly. Euphorbia rigida (above) and E. characias subsp. wulfenii are happy, but my favourite E. characias subsp. characias (with the black eyes on its frogspawn flower faces) died. With a difficult garden like this, you have to learn to love plants that many gardeners consider to be weeds. The number of complaints I’ve read about self-seeding habits on other blogs. I’m just glad something showy can create a pretty picture. I put in a special request with the Bon Viveur to bring more Euphorbia cultivars (particularly ‘Black Pearl’) back from England. Unfortunately when he arrived it was with ‘Silver Swan’. An elegant but less than tough form that will expire without a doubt up here. I’m going to plant it down on the Rose Walk and then maybe take cuttings, so I can try it in different places in the garden. The two Helleborus x sternii seedlings (from a Hardy Plant Society member’s plant of ‘Boughton Beauty’) do well – the pink-flushed seedling, closer to the parent, has not died although I thought the weather might be too cold for it. The blue pots sit in place of the two large sculptures for which the garden was made. Overall, the design is very architectural and the layout of the box hedges leads the eye and begs for something more dramatic than my blue pots and their contents. So far I have tried to fill my pots with artichokes, Melianthus major and (last summer) the tall Salvia ‘Mystic Spires’. Nothing works! I want delicately twisting double-helix metal shapes, in a kind of wild, modern style, to evoke the ‘spirit of the place’. The border below the mirror should be full of greys and yellows. But there is only about 6 inches of soil, so most things struggle. The climbing yellow rose ‘Lady Hillingdon’ hated it here and is now living elsewhere in the garden. Artemsia ‘Powis Castle’ and ‘Lambrook Silver’ don’t do badly, but I realise that I need to regularly replace them. This year 4 new seedlings were planted out. The crowning glory at this time of the year is always the Banksian rose, Rosa banksiae ‘Lutea’. It was cut hard back in autumn 2018 and has proved to flower well on the new wood. 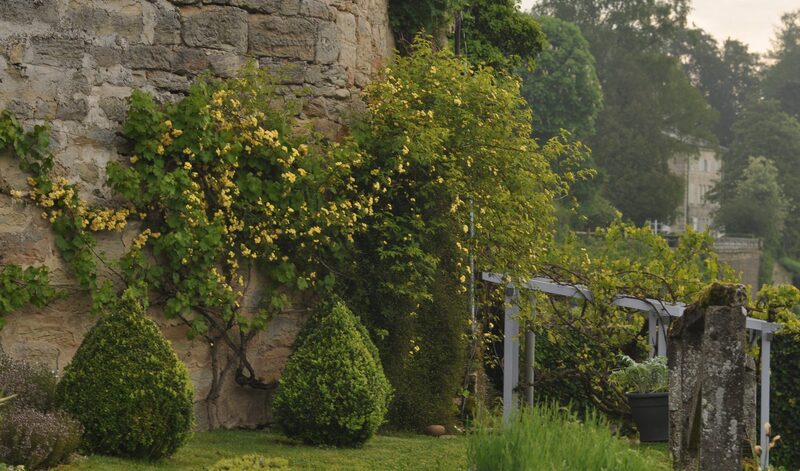 The haircut was to save the tower wall (incorporated into the house, but part of the old ramparts) from being covered in the aggressive seedlings of Muelhenbeckia complexa – that planting was definitely a mistake! The only chemical I use in the garden is glyphosate (Roundup). The Muelhenbeckia is giving way, but I don’t know what I’ll do when I get through my stock pile of glyphosate. Hopefully I’ll have won the battle by then. The other side of the rampart wall is the village street and, as you can see, our car parking area (we are gilets-jaunes friendly around here). It’s a bit late to be wishing you Happy Easter, so I’ll wish you happy May Day instead! This entry was posted in Box tree caterpillar, Euphorbia, Garden development, Good things this week, Hellebores, Herbaceous perennials, The Mirror Garden, The village of Châtillon-sur-Saône and tagged Artemesia 'Lambrook Silver', Artemesia 'Powis Castle', Euphorbia 'Silver Swan', Euphorbia characias subsp. characias, Euphorbia characias subsp. wulfenii, Euphorbia rigida, Helleborus x sternii (ex 'Boughton Beauty'); Euphorbia rigida, Muelhenbeckia complexa, Rosa banksiae 'Lutea' on April 24, 2019 by Cathy. If you are French, English, Scottish, Irish, Welsh, German, Dutch, Italian, Portugese or Spanish and you have a craftsperson or builder in your very distant past, the chances are your ancestor was coerced or paid to assist in the building of Notre Dame de Paris way back in the 12th century when Europe really began to blossom. If you are an American from one of these racial groups, you are equally involved. And there were many others, from many lands. This is a tragedy for all Europeans and those of European extraction – even those who, like the English, refuse to recognise that this is what they are. I experienced a huge crying jag on hearing that the three main rose windows seem to have survived. Why? Most of all – although I remember the cathedral as the place where Mary Stuart, later Queen of Scots, celebrated her marriage to Francis II of France – this relief was about the preservation of crucial craftsmen’s work that contributed to making this cathedral the unique jewel that we Europeans created in Paris over 800 years ago. Who does not remember the effect of light when entering a cathedral? And it was also a recognition of how desperately sad it would be to lose Notre Dame at this particular moment in history. How very wonderful that so many people all over the planet have understood how special Our Lady of Paris is. A spiritual home for all of us, if we wish. Whether Christian or not, she is a testimony to our many talents and aspirations if we direct them well. And how very bizarre that this should have happened in Holy Week, just before Easter. Let’s not let pleasure in beauty and the desire to share our talents with neighbours disappear from our lives. Even in the 12th century these were positive fuels that fired each human being involved or coerced into helping to build the miracle that is Notre Dame de Paris. This entry was posted in Thoughts on April 16, 2019 by Cathy.